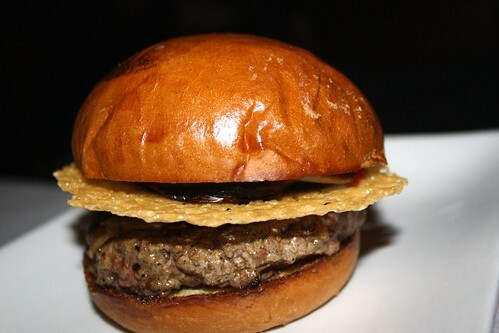 We have been hearing a lot about the infamous Umami burger so we decided to try it out last night. Jade was very excited to go because she really liked to say OOOMAMI. I ordered the Hatch burger which has lots of green chillies, and Dan ordered the original Umami with bacon lard bits. We concluded that they were good but definitely not worth the price of $12 per burger which does not include fires! It is actually a lot smaller than it looks in the picture. I will not ever be eating there again, not entirely from the steep prices but because last night it made a reappearance in my toilet. I don't think it sat well with Jade either. Last night was the first night since I can remember that she had a really hard time going to sleep. She didn't fall asleep until 10pm last night! Just thinking about this makes my stomach hurt again. For the next while I'm not allowed to lift Jade at all. This is what we came up with to get Jade in her crib. The way out of the crib isn't as easy. I still don't know if she can climb in her car seat so we will probably just be hanging around the apartment for awhile. It's only the second day and we are getting bored. If anyone wants to come visit, we'd love to have you!! *If you can't tell, Jade is singing Little Bunny Foo Foo! Auntie Jordan just taught it to her yesterday and she hasn't stopped singing it!